Mary Hood states, (in YNN v.38, no. 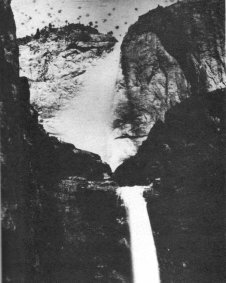 6 (June 1958), the issue that reproduced the image,) that the photograph was found in the Vance Album at Stanford University, and was not present in the Rosenblatt album formerly at the Yosemite Museum. While, most unfortunately, it seems to be true that the photo is “now lost”, it was not lost from the Yosemite Museum collection, nor from The Bancroft Library which now holds the Rosenblatt album views. Digitized by Dan Anderson, April 2007, from a copy at San Diego State University Library.